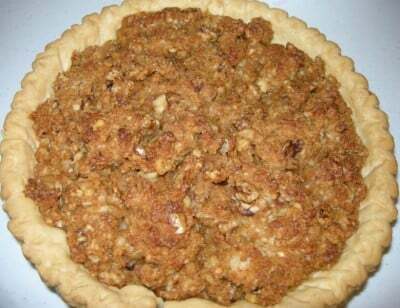 I must admit that this WASN'T my family recipe till I found it on Ms Jordon's site, Southern Plate.com. But now it's my family favorite too and I pass it on to all my family and loved ones. Don't fret over the brand names just pick what's on sale or already in your pantry. 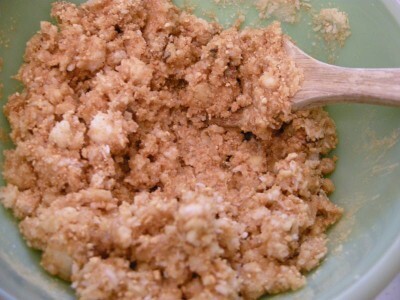 For the graham cracker crumbs, if you have graham crackers on hand, just put some in a plastic bag and crush them yourself and they’ll be fine. I separated my eggs and placed just the whites in a bowl, saving the yolks to add to scrambled eggs tomorrow morning. 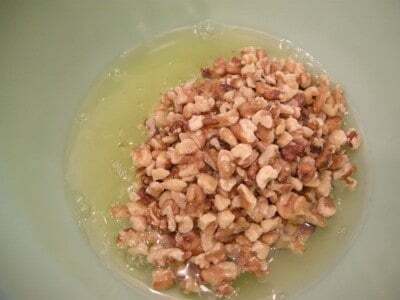 Add walnuts or pecans. Original recipe called for pecans but cheapie me went for Walnuts instead. Actually had some pecans from our three trees in the yard but was too lazy busy to crack them all. Next add in coconut. The bagged or canned varieties are fine. I always keep a bag or two in the freezer, it keeps forever. 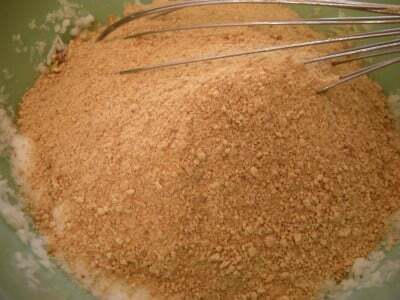 Add in graham cracker crumbs, the sawdust. Mix all of that up with a spoon. and spoon it into an unbaked pie shell. Bake at 325 for about thirty minutes, or until it looks done all over the top. 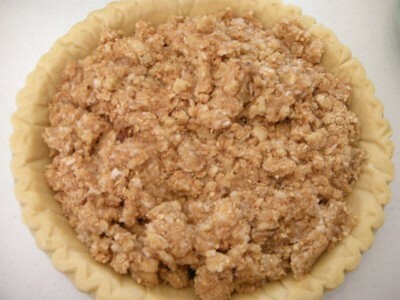 It will look kind of like a pecan pie with a thick coating of streusel on it. Cut slices while warm and add a dollop of whipped cream and some slices of bananas. Trust me, this pie is delicious but the bananas and whipped cream just MAKE it! 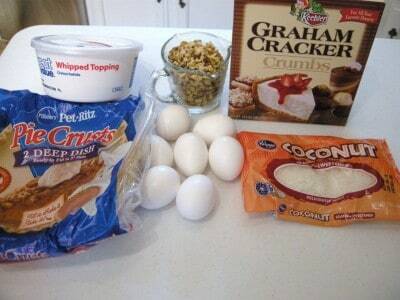 I used store bought whipped topping but my recipe and instructions on how to make it from scratch are below. 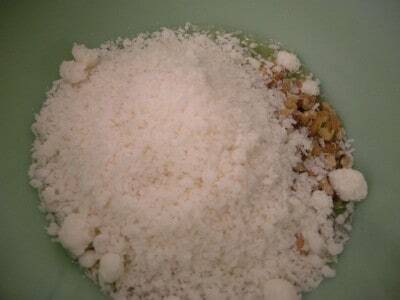 Mix all ingredients together and stir by hand. Pour into unbaked pie shell. Bake in preheated 325 degree oven until set, about 25-30 minutes. Do not over bake. Serve warm with sliced bananas and whipped cream. Homemade Whipped Cream is SUPER easy. All you need is whipping cream and a few tablespoons of sugar. There isn’t much of a science to this recipe. 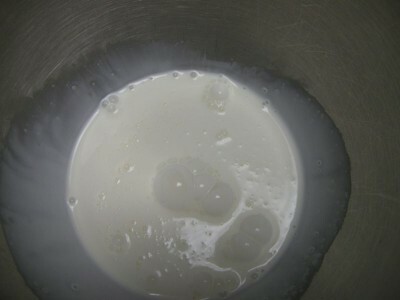 Place your whipping cream (about 16 oz. 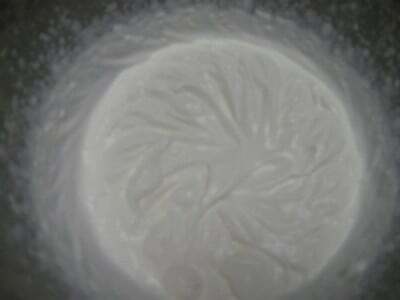 )in a chilled mixing bowl. All I do to get mine chilled is run really cold water in it and then dry it out or if I remember I stick it in the freezer ahead of time. 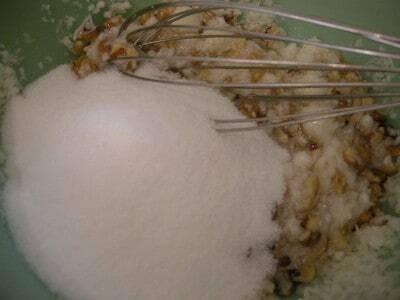 Now, add two tablespoons of sugar to your cream and beat it, on high, for about a minute. Its going to look like this, with soft peaks. You just need it firm enough to be able to dollop it on. See how easy that was? 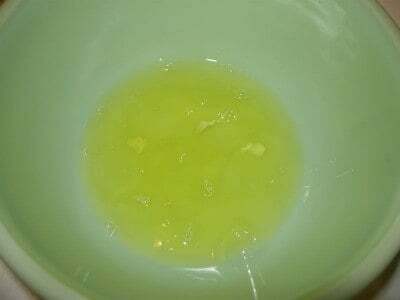 Some people like to add a teaspoon of vanilla but I just like the taste on its own. If you continued beating it after it formed soft peaks, it would actually turn into butter so this isn’t one of those things you want to walk away from – unless you want some of the best butter you’ve ever tasted. Once you see how easy this is to make and how much better it tastes than store bought, you may be spoiled for life. 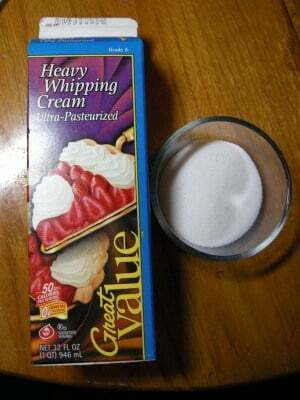 But if you forget to buy the whipping cream like I sometimes do you can always use store bought whipped cream.